There’s no denying my favourite thing to bake is a cake that involves frangipane. Be it a Bakewell Tart or Rhubarb Tart I love the almond sponge. A few weeks ago mum gave me a jar of apricots that had been steeping in a thick whisky syrup and decided that combining them with a frangipane tart would be a great cake for the Easter weekend. While not necessarily a traditional Easter cake it certainly ties to spring with the colours. While it’s lovely to use fresh fruit the wonders of preservation mean we can eat fruit all year round. I know some people are a bit stuffy about using tinned/jarred fruits but I have no such qualms as they still count as one of your 5 a day; ok maybe not when served in a cake! Preservation is an age-old method that allowed our ancestors to eat a balanced diet. If it was good enough for them it’s good enough for me. You don’t have to preserve your own fruit (though this is a great thing to do if you have a local PYO or a glut of fruit) as there is a great choice out there. If you’re not looking for uniform fruit pieces many of the supermarket’s basic ranges are fantastic for fruit salads and fillings. Another gem is to look in places like Home Bargains or B&M Bargins. You often get imports or more obscure end of lines for very good price. These apricots came from one of these stores. The pastry used in this tart is rich and can be rolled out quite thin which gives a fantastic crust to the pie. Certainly don’t skip the step of brushing the hot pastry with egg white as this seals the pastry and can stop filling leaking out. 1)In a large bowl mix together flour, salt and sugar then rub in butter until you have the consistency of breadcrumbs. Stir in the egg yolk and water until you have a smooth dough. Flatten into a disk, cover in clingfilm and refrigerate for 45 min. 2)On a floured surface roll out the dough until it is about 3mm thick then line a 20cm tart tin with the pastry. Lightly prick the base with a fork and chill for 30 min. 4) While the pastry is cooling beat together the butter and sugar until pale and fluffy. Gradually beat in the eggs and almond extract. Stir in the flour and ground almonds until well combined. 5) Pour frangipane mix into pastry case. Level out with a pallet knife. Press apricot halves in to the frangipane mixture then sprinkle with sliced almonds. Bake for 35-40 until risen and golden. 6) Allow to cool in tin before eating. 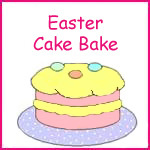 Julia Parsons from A Slice of Cherry Pie has hosted an Easter Cake Bake since 2007. My previous entries have included Mini Egg Tiffin and Simnel Cupcakes. I was pleased when she announced she was hosting it again as I already had a cake in mind. Easter in the culinary world usually means chocolate and a lot of it. As we had visitors this weekend I thought it would be a great opportunity to make my first ever sandwich cake (yes you read that right, my first!) and bake something from my newest cookbook purchase – Red Velvet & Chocolate Heartache by Harry Eastwood. Sometimes I’m a bit slow to jump on the cookery bandwagon, I haven’t attempted cake pops, whoopie pies or macarons yet. When Red Velvet & Chocolate Heartache was released in 2009 I admit I didn’t pay too much attention to it even if I’d been baking vegetables in cakes for a while. Until someone on twitter was talking about this book recently I didn’t really appreciate what it was about. This isn’t just about baking with vegetables it’s about gluten free baking and baking cakes without butter. Shocking at first the thought of baking without butter, but this can be replaced in the cake by vegetables. As Harry points out only use butter in cakes where it is going to be tasted. With the ever-increasing price of butter this is good advice. In the case of the Light Chocolate Cake the butter is replaced with Butternut Squash. While the majority of the recipes featured in the book use rice flour this can often be substituted with plain flour if you wanted to. I haven’t had a problem sourcing rice flour. Sainsbury’s sells Doves Farm rice flour, but you won’t find it by the conventional flour it’s but the free from foods. Holland & Barrett also sell brown rice flour. You would never guess this moist, fluffy cake was gluten free and tasted far from virtuous. In keeping with the slightly haphazard way I bake the two layers of the cake were slightly different sizes, I was too stubborn to go and buy two identical tins but being blinded by the chocolate no one noticed. I could have trimmed the layers to make them equal, but was running out of time. I could put the recipe below, but if you followed it probably wouldn’t work as the recipes from this fantastic cookbook are not simply recipes they are a revolution in baking. To get the most out of the recipe you need to read the introduction in the beginning of the book that explains the ingredients and methods that are different to traditional baking. To give you an idea about the recipes in Red Velvet & Chocolate Heartache Harry has put a few of the recipes on her website. I wholeheartedly recommend buying the book and look forward to baking from it again soon. It’s not often I run competitions on my blog, however when Dorset Cereal approached me about running a competition I knew I couldn’t say no as I know many of you love Dorset Cereal as much as we do. Dorset Cereal have recently launched a new cereal, Good Honest Crunch, that comes in two flavours – Strawberries & Raspberries and Toffee & Pecan. Dorset Cereal were kind enough to send us a case of this cereal and we are thoroughly enjoying both flavours for breakfast. I like these because they are not as sweet compared to similar products on the market and one of the few cereals that keep being going until lunch time. To be in the chance of winning a case of the Crunch, two of bowls and two mugs from our the new Dorset Cereal crockery range leave a comment below finishing this sentence – “Life’s too short…..” To help you get inspiration have a look what other people have said on the Dorset Cereal website. Competition is open to UK entrants only and closes 11pm on Saturday 30th April. A winner will be drawn at random. ETA: Congratulations to Lynne. The Dorset Cereal goodies are one their way to you now. Nearly every family or friend parties I’ve been to recently have been surprise parties. A good friend’s 30th back in September, a great uncle’s 90th last weekend and a cousin’s baby shower yesterday. Family & friends reading this just remember although I have a significant birthday coming up I don’t like surprises as it means I’m not given the opportunity to go clothes shopping for the event! Before yesterday I hadn’t been to a Baby Shower so wasn’t quite sure what to expect but decided I couldn’t go wrong if I turned up with cake and this was a perfect opportunity to try out a cake I’d seen in Planet Cake. I was given a copy of Planet Cake at Christmas and fell in love with it as soon as I saw it. I love the way it is set out and the designs that feature in it. I’m not a total beginner in cake making and decorating but wanted a bit of professional guidance and have found this book perfect for that. I like that this book tells you the exact quantities of icing you’ll need. Something before I wouldn’t have had a clue about. The tip about using piping nozzles for marking the icing, in this case the eyes and mouth, was brilliant. Why I hadn’t thought about that myself I don’t know. I first set about colouring the icing. I love colouring icing as in an odd way I find it quite therapeutic. Though I need a bit of practice with getting a light skin tone, this one turned out a slightly more Germolene pink, but I counteracted this by making the little hats on the cake a stronger colour. I’ve learnt my lesson in the past about letting the icing settle before using it as the colours intensify. Last time I used fondant I used a generic brand from the local cake decorating shop and found it dried out really quickly and putting me off working with fondant for a bit. This time I used a block of Silver Spoon ready to roll icing and found it really easy to colour and good to use. Even though it was a warm day when decorating these cakes the icing didn’t dry out at all. To decorate these cakes I just used a cutter that would provide a circle big enough to cover the top of the cake, No. 2 round decorating tip, couple of cocktail sticks, pallet knife and small piece of kitchen roll. I don’t own the ball tool they recommend to make the ear indentations so just used a piece of kitchen roll wrapped around a cocktail stick. The fondant was secured in place with a small amount of buttercream. I also put a blob of raspberry jam in the cake that seemed to work well. Just a note, these cakes are fairy cake sized unlike the cupcake ones featured in the book to the quantities below are for the fairy cake sized ones. I think they have a slight Pocoyo element to them and who can argue with the amazing Pocoyo! 1) Preheat oven to 180°c and line a bun tin with fairy cake liners. 2) In a bowl beat together the butter and caster sugar until it is light and fluffy then one at a time stir in the eggs. Don’t worry if it begins to look curdled add a small amount of the flour. Mix in the vanilla extract. 3) Carefully fold in the flour. 4) Fill each liner 2/3 with cake mix. Dollop a tsp of jam on the cake batter just before the cakes go in the oven. 5) Bake for 15-20 min until risen and golden. Allow to cool completely before icing. 6) In a bowl beat together the butter, icing sugar and lime juice until light and fluffy. Spread a small amount of the buttercream on top of each cake. 7) Roll out the skin coloured icing until around 3mm thick. Cut out rounds and smooth on to the top of the cakes. Then mark the eyes and mouth then using a small amount of water attach the nose and ears. 8 ) Roll out the blue/pink icing and using the same round cutter cut out rounds. Cut these circles in half then cut a 5mm edge off the semicircle (this will be the ridge on the hat). Stick the semicircle on the head using a small amount of water then attach the rim. Use a cocktail stick along the rim to give the detail. 9) Using a small amount of cornflour and red petal dust mixed together, brush on the cheeks to give babies a rosy glow. Given the Midlands has great food heritage, wonderful places to buy food can be few and far between. In amongst the rough there is some diamonds. Brown and Green is one of these. Their aim is to provide local, artisan & ethical produce. They have a shop in Trentham Gardens, that I had heard great things about, and a couple of weeks ago they opened a sister store at Derby Garden Centre near Little Eaton. I popped in on the opening day and was really pleased with what I found and have since returned with Hubs to stock up on picnic essentials for a trip to Kedleston Hall. It’s great to see so many local brands being stocked from the delicious Needwood Ice Cream (I think the best ice cream you can get), Quirky Cookies, Septimus Syder to the Aged Leicestershire Red, plus from the other side of the Midlands Coopers Gourmet Sausage Rolls (Hubs adores their sausage rolls with black pudding called Piggy Black) and Westons Stowford Press which brings back memories of last year’s holiday. On our trips there I’ve also spotted venison salami, some amazing looking savory eggs plus lots of other fabulous products. If your ever in the area I seriously suggest you visit. The garden centre where it’s based is good too. What I love about Brown & Green is that it’s down to earth, fabulous quality, reasonably priced and friendly. Not all food stores are like this and it’s a shame. Good food is for everyone, not just for people who can afford it. If I was to run a food shop I would run it exactly like Brown & Green. Thank you very much to Brown & Green’s Susie for the photographs. When deciding what to do for a Royal Weddings bake I wanted to combine my desire to bake something a bit kitsch and the fact that the Royal Wedding means we get a Bank Holiday. What’s the activity Brits stereotypically do on a Bank Holiday, apart from catching up with the DIY and watching Sound of Music? Head to the coast, no matter the weather, and eat Mr Whippys on a wind-whipped beach. The last made I made Ice Cream Cupcakes was for my Birthday a few years back. Now I own a Wilton1M tip I decided to give these cakes another go. I’m still getting there with my piping technique. What you can’t see is the gaps at the back between the cone and the icing! By the time I make them again at the end of the month I’ll be better. I need to keep remembering to hold the tip at a 90° angle to the cake. Thank you to the people who have also given me the tip to add a small amount of milk to get the buttercream smoother when being piped. I think I got a bit overenthusiastic when beating the butter and sugar. The best types of colours I find are the gel/paste colours as they don’t water down the icing and allow you to get the intense colours. The colour also intensifies once the icing is left to rest so be aware of this when your mixing it. Since I took the photos for this blog 2 hours ago the colours on the cakes are now very much vivid! The best tips I can give for the buttercream is to please use butter (products like Stork, Trex etc taste awful in buttercream) and whip it more that you think you need to. The more you whip it the whiter and fluffier it will become but don’t go too mad or, as you can see in the photos, while you have super fluffy icing the bubbles in the buttercream give rougher edges. So what are you making and baking for the Royal Wedding? 1) Preheat the oven to 180oc. Beat together the sugar, butter and eggs, then mix in the rest of the ingredients. 2) Line up the cones on a baking sheet. It does make it slightly easier if you put the cones in the cups of a bun pan or individual silicone cupcake liners. 3) Fill up the cones about 2/3 with cake mix. Don’t overfill or they erupt over the top. Bake in the oven for 15 min, or until they are golden and pass the skewer test. Allow to cool on a wire rack before icing. 4) Once the cakes have cooled beat together the butter and vanilla extract then gradually add the icing sugar. Beat until desired consistency. Split the icing in ¼. Colour one ¼ blue, another red and the remaining icing stays white. Spoon into a piping bag. You can either put all the icing in the bag together (like above) or make 4 individual piping bags and put them inside a bigger bag. Pipe the swirls on the cakes. Decorate with a flake. Leave for a few hours to allow the icing to set.